The traditional approach to performance management was invented to fulfill the needs of the industrial society. The focus was at that time on homogeneity and flawlessness, and factory workers were expected to perform monotonic tasks. The production line was always moving: sometimes faster, sometimes slower, but the tasks were always the same. Performance management has evolved since those days, and now performance is being improved by preventing mistakes beforehand. Nowadays as much as 70 percent of jobs are in the service sector and especially professional services are on the rise. The nature of professional work differs greatly from the traditional production line work. In professional work, employee’s skills, attitude and the ability to empathize are essential to performance as well as teamwork skills. Homogeneity and uniformity can’t be the measures of performance; a different kind of approach is needed, which will take into account the differences between the employees. In some industries, like software development, the performance level of the top performers can be tenfold compared to the average performer. I believe the reason behind this is that top performers are taken into account very well in the traditional performance management culture. They get rewards, attention and autonomy all at the same time. There’s nothing wrong with this; the problem lies elsewhere. However, traditional performance management often fails to pay regard to the average employee. This is a huge weakness, as most of the employees naturally are, by definition, average. If the average joe or jane does something a bit better, no one notices. But we should! If we multiply the improvement in performance with the number of average performers, the minor improvement will be a huge deal for the company. Performance management should be used to make good basic work visible. In my earlier blog posts, I’ve already mentioned limited and unlimited resources. For most companies, money is a limited resource, whereas social recognition and social rewarding are unlimited resources. These tools should be used carefully as well, or the pep talks and praises will turn into bad theatre. Nevertheless, praise should always be given in public. When the average employee sees that her average colleague is being praised, she can identify herself with her coworker. “Even I can do that!” she thinks. When top performers are being rewarded and praised, the average joe can’t find anyone to identify with. This will, on the contrary, decrease his performance level and make him feel depressed. Gamification is a way to encourage and pay attention to everyone’s individual needs. At Cloudriven, we track performance on a weekly basis and all our important actions are shared with colleagues, who can encourage, comment and give feedback. Usually the work community tends to support those, who are in need of encouragement. When my week hasn’t been that successful, the community has given me their support. Performance management culture is changing and the traditional performance appraisals are slowly losing their importance. The most essential thing about performance management should be increasing motivation right here and right now. Gamification fits this definition like a glove. Gamification allows us to share unlimited resources easily and automatically, which motivates even the average joes to better results. 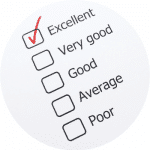 Do you have to fill in performance appraisals once or twice a year in your workplace? Does this form filling process feel meaningful to you? Do the forms have any connection to your daily work? According to research, man is happiest when he collaborates with other people and pursues meaningful goals. The best way to encourage him for better performance is to give him positive feedback on his actions often enough. In order to perform better in the ever so tough competition, companies are aiming at being agile and innovative in business, and at the same time they wish their employees would be more active, and responsible, and helpful for their colleagues, and have initiative. Have you ever heard of a company that would not try to get rid of the silos? These goals are really something to stand up for, but too often they are not being lead through the organization. I argue that the only reason these practices are kept alive is tradition; this is the way it has always been and there’s no knowledge of better. However, research shows that this traditional approach to performance management will most likely lead to undesirable behavior: avoiding mistakes, repeating old patterns and doing just the minimum. Of course the traditional approach and negative interference to poor performance can quickly adjust the performance level for better, but this will not bring about lasting change. It doesn’t encourage employees to top performance and it surely does not advance innovativeness. In our opinion, innovativeness and agility are not the sole privilege of startup companies. It’s mostly a matter of inspiring leadership and management. What I certainly don’t mean with inspiration in this context, is management blogs and videos shared in the corporate intranet, if at the same time employees are filling out performance appraisal forms which don’t have a clear connection to the mood boosting videos published a week before. Corporate culture is formed based on what is being done and what kind of actions the processes promote; not based on what we say we’re going to do. We at Cloudriven want to make performance management inspiring, engaging and social – who knows, maybe even addictive :). We also want to monitor work progress on a daily and weekly basis, give positive feedback for performance and attach work to a broader context and meaning. Our goal is to help our clients to create sustainable value in their business. Natural byproducts for this are better work and customer satisfaction as well as better financial results. If you still believe in the traditional way of management, fear not. Inspiration, engagement and social are not synonyms for laziness. Sweat will still be the cologne of accomplishment and success the ladder you cannot climb with your hands in your pockets. We’re not going to demolish the significance of individual performance, yet we’re putting it into a larger frame. How does that happen? Invite us for a coffee and we can find the solution that best fits your organization’s needs. 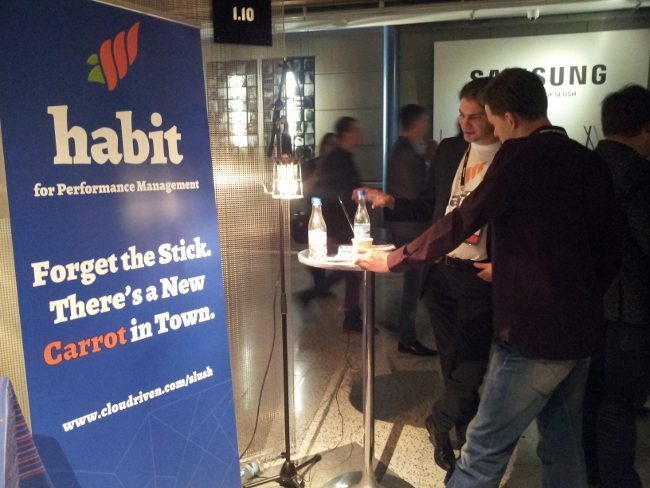 Be sure to check out our Habit for Performance Management solution as well. Slush 2014 is over and little by little our lives are going back to normal. This was Cloudriven’s first year in Slush: we learned a lot and we will definitely be back next year. Our team had loads of good meetings with potential investors, who really liked our approach to performance management. But most importantly, the carrot cake we served at out demo booth was delicious and received lots of compliments from the visitors. The cake was hand-baked by our Head of Customer Service. Thank you, Anu! If you want to know more about our Habit approach to these topics, don’t hesitate to contact us! Most of the Finnish companies are managing performance from the past instead of looking into the future, claims Cloudriven’s CEO Jukka Koskenkanto. He says that companies should react to changes faster and invest more in employee engagement and motivation. Meaningful work and agility are not the sole privilege of growth companies. Performance management is described in business literature as a process that aims to improve the performance of an organization, group or single employee systematically and purposefully. Traditionally the most important elements of the process have been performance appraisals, development discussions and daily management practices. “The mere idea of being able to manage performance apart from the employees themselves is absurd. Success is built in our daily actions. In order to succeed, we need motivated and engaged doers, that is the right people, and the right actions”, says Jukka Koskenkanto. Money and rewards can motivate the employees to a certain point, but the best motivator is the experience of meaningful work. In order for the work to be meaningful, employee has to commit to the values and strategic goals of the organization and understand the relevance of his own work in achieving the organizational goals. Management model based on annual or semiannual performance reviews reacts too slowly to changes, and it doesn’t encourage and lead employees to take the right actions at the right time. The idea of development discussions is to get and give feedback, but feedback should be received instantly, not after six months. Instant feedback is the only efficient way of developing your actions, and you should also be able to get work-related feedback from your colleagues, not just your manager. ”Companies have focused on digging the past instead of learning from their own actions and adapting their operations accordingly. What should be done, is to lead the future actions, not just state the past mistakes when it’s already too late to change the course”, tells Business Director Antero Törhönen. 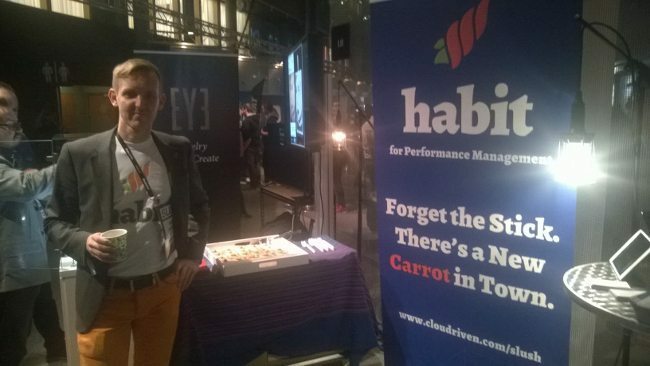 Antero and Jukka will be introducing Cloudriven’s new Habit for Performance Management product in Slush on Tuesday 18th November. Habit makes performance management agile and social and part of every employees’ daily work. ”Agility is not the sole privilege of growth companies. Even enterprises should be able react quickly to changes and inspire their employees for better performance. This was the starting point for the development of Habit”, Jukka tells.